A women’s college basketball powerhouse has emerged within the depths of the mid-major pool. The Quinnipiac Bobcats, winners of 52 straight games against MAAC opponents, have achieved this level of dominance within their conference thanks to selfless play, internal hunger to prove doubters wrong and a team-first culture, among other things. From the outside looking in, it seems personal accolades are not prioritized by any player or coach who dons the blue and gold. This is usually the case with great teams in any sport. More times than not, personal achievements come with sustained team success. Aryn McClure, Jen Fay and Paula Strautmane- arguably the three most impactful players for Tricia Fabbri’s squad on the court- can attest to this. All three players have reached the illustrious 1,000-point mark in their respective careers, making them the only trio in Quinnipiac women’s basketball history to accomplish such a feat. 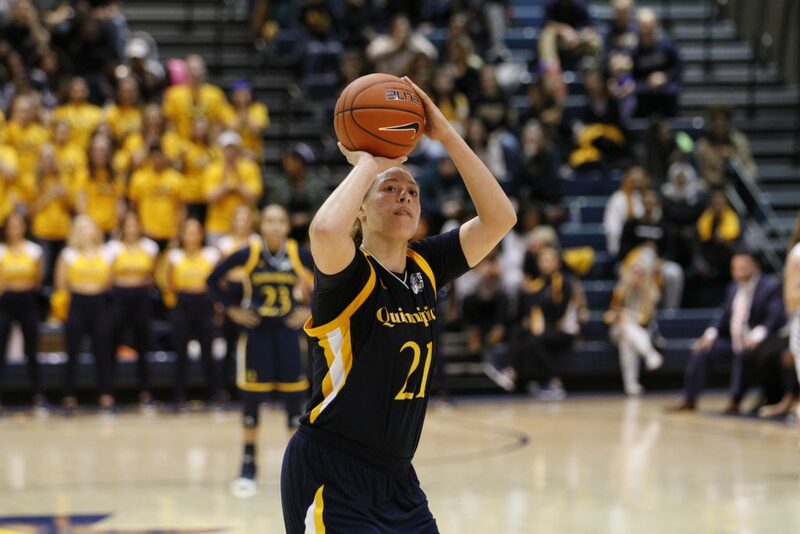 For McClure, who knocked down her 1,000th point in Quinnipiac’s victory over Marist in last year’s MAAC Championship game, scoring this many points was never something that crossed her mind. The New York native has been efficient offensively throughout her entire career in Hamden. In the last two years, she averaged over 12 points a game as a junior, and a touch over 10 points a game in her senior campaign. Even though she puts the ball in the basket at a consistent rate, McClure still finds humor in hitting the 1,000-point threshold. McClure is not the only Quinnipiac star who has seen team-oriented basketball translate to personal success. Redshirt Senior Jen Fay, who notched her 1,000th point in a loss to No. 10 Texas in the team’s fifth game this season, attributes all of her achievements to the women she battles with on the court. Fay is a player born for the big stage. Look no further than her capturing two consecutive MAAC Tournament Most Outstanding Player awards in her last two seasons as proof. Pairing those individual trophies with 1,000 career points and other milestones in Hamden could not be achieved without the guidance of one specific person, according to Fay. Tricia Fabbri’s success on the court as the all-time winningest coach in Quinnipiac women’s basketball history speaks for itself, but her connection with players off the hardwood is second-to-none. It’s the reason she has three 1,000-point scorers on her roster rather than two. Paula Strautmane was born roughly 4,125 miles away from Hamden, Connecticut in Riga, Latvia. When she toured Quinnipiac as a potential recruit, the now-senior forward quickly fell in love with her surroundings, from the aesthetics of the campus to the people. Strautmane knocked down her 1,000th point from the charity stripe in mid-January against Monmouth. Just like McClure, she never saw such an achievement coming her way due to her offensive tendencies. Even without personal aspirations of hitting the big four digits in points, all three players managed to put the ball in the basket with consistency throughout their careers to get there. But as we know, that doesn’t matter to McClure, Fay and Strautmane. McClure says progressing past the Sweet 16 in the NCAA Tournament- a stage the Bobcats reached in 2016-17- is what pushes all members of the Quinnipiac women’s basketball team to their limits. And if personal glory comes with that, so be it.